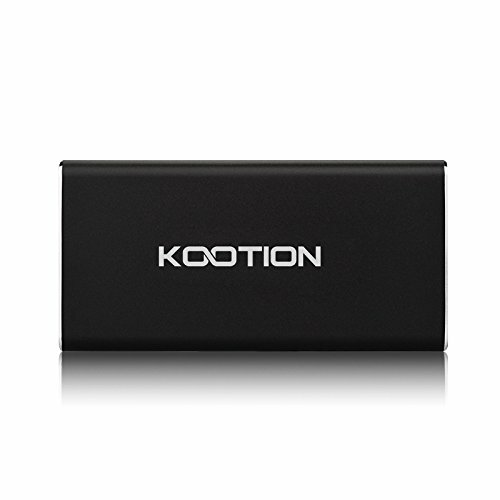 KOOTION X1 Portable SSD offers a large storage capacity of up to 64GB in a pocket-sized design. sleek, lightweight and portable design make it a perfect data storage for copying and transferring your files, photography, videos or any other large documents in seconds. It's the ideal solution for photographers, videographers, graphic designers or any mainstream computer user who needs to back-up or transfer large files. Take all of your data with you whenever you need it and have the ability to offload it quickly. UNIQUE DESIGN: Ultra-compact, Sleek and portable, aluminum housing provides excellent protection and heat dissipation. Shock resistant, it's a plus when you move around a lot. INTERFACE: Built with USB3.0 ports （compatible with USB 2.0/1.0）. Easy to use, just plug it in, and no require external power supply. HIGH SPEED FILE TRANSFER: Read up to 430 MB/s；Write up to 160 MB/s. It is faster than traditional usb3.0 port. PERFECT COMPATIBILITY: Compatible with Windows 7/8/10/ Vista /Windows XP/Windows 2000/Windows ME/NT/Windows 98second edition/Linux/ Mac OS. WARRANTY: KOOTION provides a 12-month warranty and free lifetime technical support. If our product has any questions, please feel free to contact us.